I made the 3D piano a week in advance using pastillage fondant. Every part of the piano is hand cut out and join together. Then on the day of the birthday I baked a 10" square cake and frosted it with whipped cream. I cut out a red rolled fondant and put in the middle of the cake. The music notes are made of fondant too. 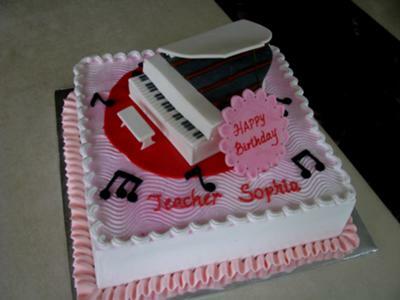 Finally I placed the 3D piano on top of the cake right before the birthday party started. Well, you have explained quality of education in such a way that general people come to know its importance. The problem in todays’ world is that students don’t have knowledge which field to choose. The best solution of this is to visit our best essay services that conduct a short meeting online with native writers who will guide you in batter way.